Ah Hoi’s is a somewhat famous Singaporean restaurant. They offer a wide variety of dishes but it best serves families and groups. Being an a trip with the Saviour meant that we had to order enough for 4 people and then take a lot of it back to our hotel. The main reason we chose to eat at Ah Hoi’s is because of the chili crab, which was recommended, and the fact that we were staying at the Traders Hotel. Ah Hoi’s is connected to Traders Hotel but I would imagine the management of the kitchen is very different to the hotel itself. I found the experience to be nice but I did order too much food for 2 people and it appears the restaurant is better suited to people in large groups of 8 or more. The restaurant itself is a mixed bag. Some people will love it and others will hate it. 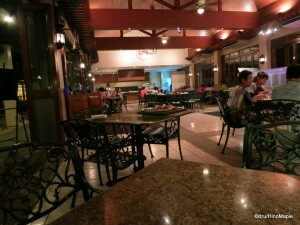 It is an “outdoor” restaurant with terrace seating next to the pool of the Traders Hotel. There are a lot of bushes to prevent you from seeing the people by the pool but the entire restaurant is opened to the outside so that you have an outdoor experience. I found it nice and reminiscent of going to a hawker, but without the apparent dirt and self-serve service. I easily made reservations with the front desk and was promptly seated when I arrived. I didn’t need reservations but I made them just in case. On the day I was there, there were a few large groups including a large Chinese family of about 16 people. Many people complain about the service at Ah Hoi’s and I agree that the service can be very slow. I didn’t have too much trouble flagging the servers at first and getting my food was pretty quick. The biggest problem came when I wanted to get things packed up and to go back to my hotel. I was stuffed, so moving wasn’t so easy but trying to get them to do something was painfully difficult. This is not necessarily a problem with the servers; rather it is a problem with the management. The management decided to understaff the restaurant so that they end up running around helping various tables all night without much chance to rest. I think they could have done with at least 2 or 3 more servers a night and the service would have been much better. As for the food, the food was pretty good. I enjoyed all of it. I started off with some satay, but the Saviour isn’t a big fan of satay. I just wanted it as it is a specialty in SE Asia. 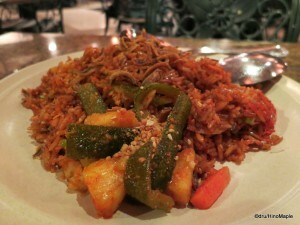 We also ordered some Nasi Goreng and of course the Chili Crab. Let’s just say that the satay and Nasi Goreng would have been more than enough for us and the Chili Crab would have been too much for us as it was served. 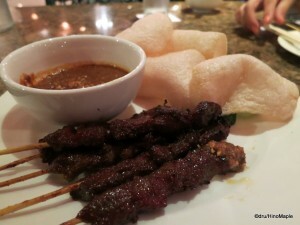 The satay was good, but I have to admit that I prefer the satay in Malaysia over the satay in Singapore. While both are good, I found the seasoning to be better in Malaysia and the coconut rice, I’m not sure if it was coconut rice, was better in Malaysia too. I thought the Singapore version was a little dry but it could have been Ah Hoi’s choice. The Nasi Goreng was delicious. It was my first dinner in Singapore and I wanted spicy food. The Nasi Goreng was so spicy that my mouth was burning. I loved every bite of it and even poured some of the chili crab sauce over the rice. 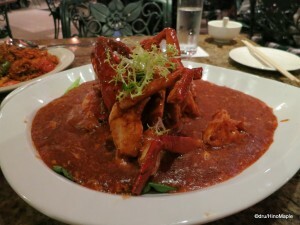 The chili crab was also delicious but we were shocked when it came. The crab was almost as big as my head, and the plate was much bigger with tons of sauce. It is popular to eat chili crab with fried buns, so we ordered just a single bun, which comes in 2 pieces. You can also get steamed buns but it wasn’t necessary. Needless to say, chili crab is a very messy ordeal. You will struggle to eat it without getting it all over the table. I’m pretty slow when I eat crab and it took a while to eat this one. We ended up taking half of the food home with us at the end of the meal. Ah Hoi’s is a nice place to visit and for my first visit, it was nice. I don’t know if I would go back again as I thought the prices were too high for a couple. I did get my money’s worth as it ended up being worth 2 meals rather than 1. If you look at it as a group, it is worth it as you can also sample many different dishes. I wish I had the chance to try more but it is difficult when travelling alone. The food is good, the service is a little slow, but if you are on vacation, why would you care about slow service? Taking it easy and not being too busy is the ideal point of a vacation, at least for me. I’m sure they can improve a lot with a few more servers but if the restaurant lives up to their reputation, they won’t be hiring anyone to help out anytime soon. This entry was posted in East Asia Food and tagged Ah, Ah Hoi, Ah Hoi's, Chili, Chili Crab, Crab, Goreng, Hoi, Hoi's, nasi, Nasi Goreng, Orchard, Satay, Singapore, Traders, Traders Hotel by Dru. Bookmark the permalink.